Community members enjoy food and drink at the Miami Erie Medical Center Open House. 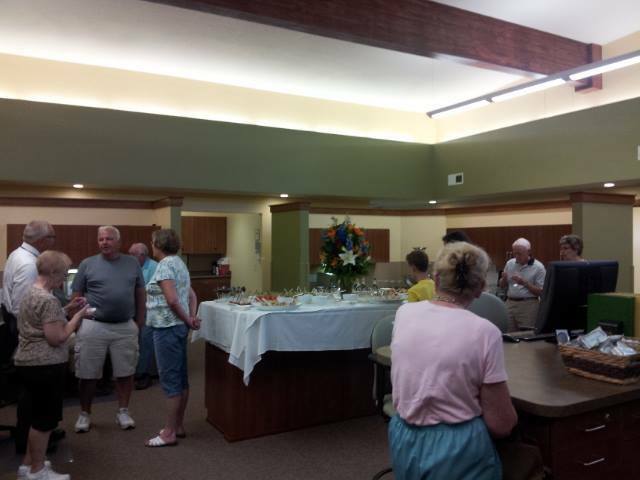 MINSTER– The Miami Erie Medical Center, in between Minster and New Bremen, held an open house Thursday night to celebrate their remodel and addition. The goal of the remodel was to make a smooth transition from the old part of the building to the new part, according to Grand Lake Health Systems Vice President of Human Resources and Support Services Art Swain. They wanted to blend the spaces. They updated patient rooms, offices and now have a bigger conference room for speaking to groups. They have their own x-ray room that doubles as a safe room in case of tornado’s or other life-threatening issues. The group wanted a bigger space so they could serve Minster and New Bremen both, said Swain. The facility addition was contracted by H.A. Dorsten and designed and engineered by Garmann & Miller. The event was put on in conjunction with the Southwestern Auglaize County Chamber of Commerce. Executive Director Logan O’Neill said they wanted to help promote a member business. The event featured door prizes, food and drink, along with a self-guided tour of the facility.